Heidi's Imaginarium: Sweet Sketch Wednesday and 100 Sketches! They are having a party over at Sweet Sketch Wednesday celebrating 100 Sketches! If you have not already, be sure to check out this great blog and become a follower! Here is the card I made for sketch #100. I know I over did it on the flowers and embellishments. I made this for a colleague and I really wanted it to be extravagant. 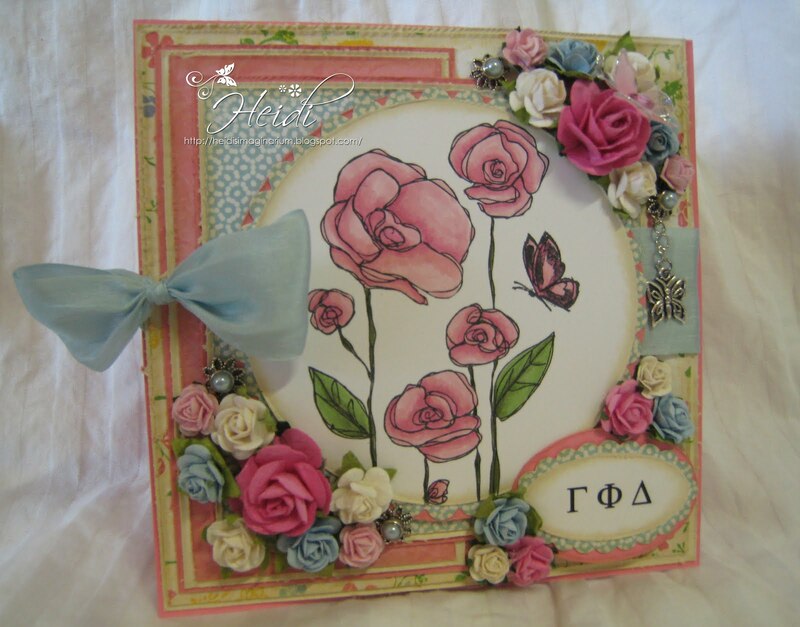 Wonderful, beautiful card, lovely floral image. OMG Heidi. This card is simply stunning. Hi Heidi, it not over the top one little bit, it's just wonderful. You know me I love flowers. Love this image, the colours and your papers they are just so perfect. What can I say about your floral arrangement it's perfect, for a pefect card for a special occasion and a celebration. I love it it's wonderful and thank so much for sharing it with us at SSW this week for our 100th Sketch and good luck with the blog candies. Ohhh Heidi, what a beatiful garden full of roses. this would make a wonderful Mother's Day or Birthday card. Your colleague will love this card. It is gorgeous! Thaks for joining our celebration this week. OMG Heidi!!! Absolutely stunning!! Love the beautiful images and your gorgeous flowers. Thanks so much for sharing with us at SSW and joining in our 100th sketch party! Heidi, this is really gorgeous! You have totally outdone yourself! Thanks so much for playing at Sweet Sketch Wednesday. Absolutely gorgeous and all of those flowers are just sunning! Thanks so much for joining us for our 100th Celebration at Sweet Sketch Wednesday. Gorgeous card for your friend! I love all the flowers, the lovely sheer bow and I am a lover of blue and pink! All your elements are perfect with the sweet flower image! Beautiful coloring too! Thanks so much for playing along this week at our SSW 100th Celebration! Oh your card is gorgous. Anyone would love getting this card. The detail so stunning. Thanks for joning in the celebration. Arlana @SSW!!! Gorgeous card Heidi, Such a lovely image and beautiful colourway. I just bet she is thrilled to receive this. Heidi this is another one of your stunning creations - this one is gorgeous with all the flowers, pearl brads and charms and of course all the wonderful layers and DP. The image is lovely here with your expert coloring but has simple and elegant feel - so well suited with all the other details. You have such wonderful talent and we're so fortunate to have your inspiring work in the Sweet Sketch Wednesday challenges week after week. Thanks for all the support you show to SSW, especially in helping us celebrate our 100th sketch milestone.